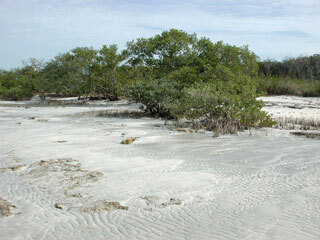 Mangroves protect shorelines from erosion. Mangroves protect shorelines from damaging storm and hurricane winds, waves, and floods. Mangroves also help prevent erosion by stabilizing sediments with their tangled root systems. 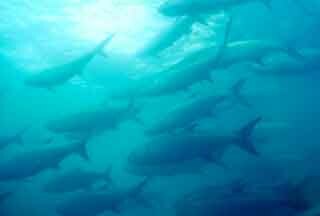 They maintain water quality and clarity, filtering pollutants and trapping sediments originating from land. Mangroves serve as valuable nursery areas for fish and invertebrates. Serving as valuable nursery areas for shrimp, crustaceans, mollusks, and fishes, mangroves are a critical component of Florida’s commercial and recreational fishing industries. These habitats provide a rich source of food while also offering refuge from predation. Snook (Centropomus undecimalis), gray snapper (Lutjanus griseus), tarpon (Megalops atlanticus), jack (Caranx spp. ), sheepshead (Archosargus probatocephalus), and red drum (Sciaenops ocellatus) all feed in the mangroves. Florida’s fisheries would suffer a dramatic decline without access to healthy mangrove habitats. Mangroves Support Threatened and Endangered Species. In addition to commercially important species, mangroves also support a number of threatened and endangered species. These species utilize mangrove systems during at least some portion of their life histories, while others reside their entire life spans, feeding and nesting within the mangroves. Mangroves are utilized in many parts of the world as a renewable resource. In other parts of the world, people have utilized mangrove trees as a renewable resource. Harvested for durable, water-resistant wood, mangroves have been used in building houses, boats, pilings, and furniture. The wood of the black mangrove and buttonwood trees has also been utilized in the production of charcoal. Tannins and other dyes are extracted from mangrove bark. Leaves have been used in tea, medicine, livestock feed, and as a substitute for tobacco for smoking. 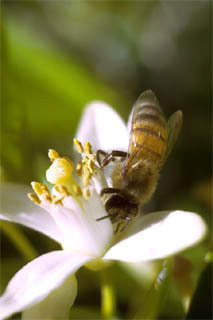 In Florida, beekeepers have set up their hives close to mangroves in order to use the nectar in honey production.